Deakin University in Melbourne was the venue for a conference that examined the ‘Recording, Narrating and Archiving the First World War’ for the International Society for First World War Studies. This was the first time this interdisciplinary conference has been held outside the northern hemisphere. It brought together historians, archivists, librarians, archaeologists, curators, sociologists, artists, film makers, linguists, philosophers, military specialists, school teachers and those interested in cultural studies. Around 100 delegates from across the globe listened to and presented a range of papers across three parallel sessions. These ranged from Rowan Light’s analysis of ‘Maori television and the reshaping of New Zealand war memory’ to the ‘gift to the nation’ from the Australian Red Cross and the records recently lodged at the State Library of New South Wales. Invoking the mythology of the ‘ancient Athenian citizen-soldiers’ Sarah Midford re-interpreted the stories of the Dardanelles campaign at Gallipoli, providing a fresh look at an old topic. Julia Riberio discussed French poetry and Alexander Nordlund examined British soldiers’ letters, while Sebastian Willert talked about his inquiries into the archival material of the Deutsch-Türkishe Denkmalschutz-Kommando in 1916. The transnational character of the memory of the Great War was illustrated by Maria Inés Tato in her work on the social and cultural history of the First World War in Latin America and Argentina in particular. The role of the USA and the memory of the war was dealt with by a number of papers including Kathelene McCarty Smith’s paper on ‘Mobilizing Citizen Archivists’ in North Carolina, while Diane North examined California and the war. First World War studies show no sign of letting up on yielding new material, new interpretations and new analysis. As one of the seminal events of world history in the 20th century the legacy of war is all around us, in ways we do not always notice. WWI is a living force that still provides a host of challenges for many. Collectively, the papers were a testament to how research in this field continues to give up its dark secrets. The ever-present legacy of Charles Bean cast a shadow over the papers of the Australian delegates. His Official History of Australia in the War on 1914-1918 is still contested ground and its influence is still felt strongly by those interested in operational military history and the war more generally. Bean has had a key position in the nation-building narrative of the Gallipoli campaign and the development of the Anzac mythology. The First World War is presented to us today in ways that shape our cultural memory of the past. Storytelling through shared memories and experiences suggests that the wartime narratives of the First World War are an evolving feast. Commemoration and its re-interpretation in the national narrative were analysed by Emma Wensing in her paper on the ‘unauthorised’ Anzac Centenary commemoration. She showed that many Australians remember the First World War in ways that are outside the authorised versions of the war. Vernacular tributes by textile artists, quilters, embroiderers and cake decorators show how they have used their agency in the context of craft to remember a spectrum of emotions. Our understanding of national heritage and collective memory are sometimes challenged by the authenticity of ordinary Australians, who want to validate their own responses to war using alternative commemorative practices. Similarly, Joanna Leahy’s analysis of wartime knitting demonstrated that while socks were items of material culture, their functionality was only one part of their story. Knitting was part of a ‘larger network of meanings’ which ‘provide a richer view of women’s experiences of war’. Crafts were practised during wartime in a wider cultural context and reflected ‘some of the broader themes of Australian history’. Wartime knitting represented not only women’s patriotic participation in war but ‘also ways in which women mourned and remembered’. It is important to consider the impact today of how these cultural objects are presented by ‘museums, libraries and archives’. Newspapers from small rural communities provided a different story of the war. Ian Willis explained that the intimate nature of small closed communities produced local newspapers that were riven with parochialism. 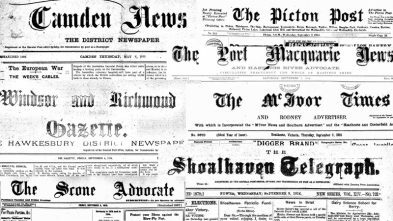 Across the English-speaking world, local newspapers transformed private intimate knowledge into public information. The Melbourne Conference of the International Society for First World War Studies provided many challenges and food for thought for researchers and those interested in the continually evolving story of the war. Thanks Ian – hope to catch you a History in July tonight. I’m glad to hear that there’s no let-up in WWI studies even as the centenary season comes to a close.